James? George? What Will 'Baby Cambridge' Be Named? : The Two-Way London bookies are taking bets. James, George and Alexander are among the favorites. Louis, Henry and Arthur are drawing interest as well. What will it be? 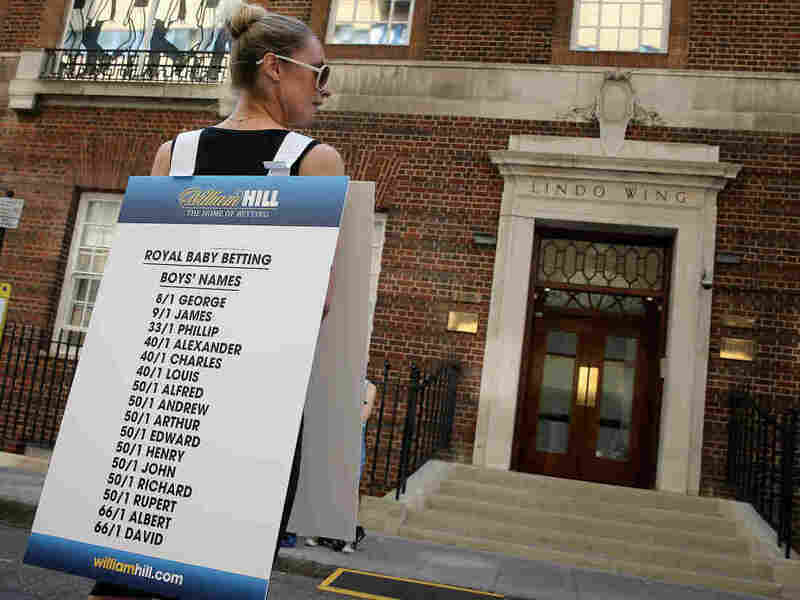 Outside the London hospital where the newest prince was born, betting parlors have been advertising the odds on names. Now that he's been born, the next big moments in little Baby Cambridge's life will be when he's seen in public and when the world hears what his name will be. On Morning Edition, NPR's Philip Reeves said the first glimpse of the duke and duchess of Cambridge's baby boy could come as soon as today, if he and his mom (the former Kate Middleton) head home from St. Mary's Hospital in London. As for when the boy-who-could-be-king will get a name, that's less certain. The Guardian reminds readers that "it was seven days before the Prince [Charles] and Princess [Diana] of Wales revealed that they had chosen William as the name for their firstborn, although Prince Harry was named immediately." London bookies haven't been waiting, of course. They were laying odds before the baby was born on everything from gender to hair color and the eventual name. As of Tuesday morning, the favorite names were James and George, with Alexander and others such as Louis, Henry and Arthur not too far behind. Others on the board at the betting firm Coral included three of the four Memmott boys' first names — Albert, Edmund and John. Two of the Memmott clan — Edmund Arthur and Albert James — have double the chances of sharing at least some of royal scion's moniker. Mark, alas, wasn't among those getting even 500-to-1 odds. What will the baby's name be? We've got a very nonscientific survey here.